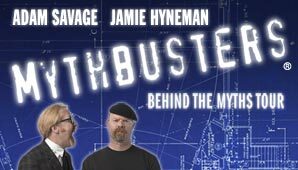 Mythbusters – Behind the Myths Live is coming to Australia in August this year: For Sydney the date is Saturday 23 August. That’s pretty exciting stuff: We actually do get to try the live show at home! And given that the show’s producers are Australian – it’s about time. This show has been touring for a while in the US to good reviews (for example from Boing Boing) and, even though as my kids have become older we don’t watch Mythbusters so regularly, it looks like too good an opportunity to pass up. Tickets are on pre-sale from 27 March and general sale from 1 April. I can’t see prices available yet. For details on the live tour generally see here, for more on the Australian tour and tickets see here.